I promised you a post, and I’m through breaking blog promises, which we all know are the most sacred of the promises. I designed and framed this for my sister in law for Christmas. If you don’t recognize the quote, it’s from Dr. Seuss’ The Lorax. It has been her favorite book since forever and since we were trying to do simple gifts this year (and simple to mail to Texas) I thought this would be a nice little trinket. I made it in yellow and gray to match her decorations, and gave it a cute little frame. All in all I think it was effective. I bring this up because I just went to see The Lorax in theaters. It was really bright and happy and fun, and I think the animators/illustrators did an amazing job. I also think that the quote itself is always worth a re-iteration. I was never a big Dr. Seuss fan, not until I got older actually. I think I probably read One Fish Two Fish and Green Eggs and Ham once or twice as a kid, but it wasn’t until a high school teacher read us Oh The Places You’ll Go that I really started to see the value in his rhymes. Maybe you’re tired of the environmental message or the down with big business spiel that the Lorax always gets pegged with (or maybe you’re not), but I think the really important part of this book/film is exactly that quote. It makes you feel something, or me at least. And it makes me think. It makes me think about what I complain about that I do nothing to change. It makes me think about what I care about, and what injustice I see. It makes me think about what I can do to help. Maybe that injustice does include big business and the damage to the environment. It often does for me, but I can relate this even to my business. If I don’t have enough clients, sitting in my living room watching Downton Abbey isn’t going to change that. If I don’t have the skills I want or need, where can I go and what can I do to get them? It’s about being proactive I guess. Find what it is for you. 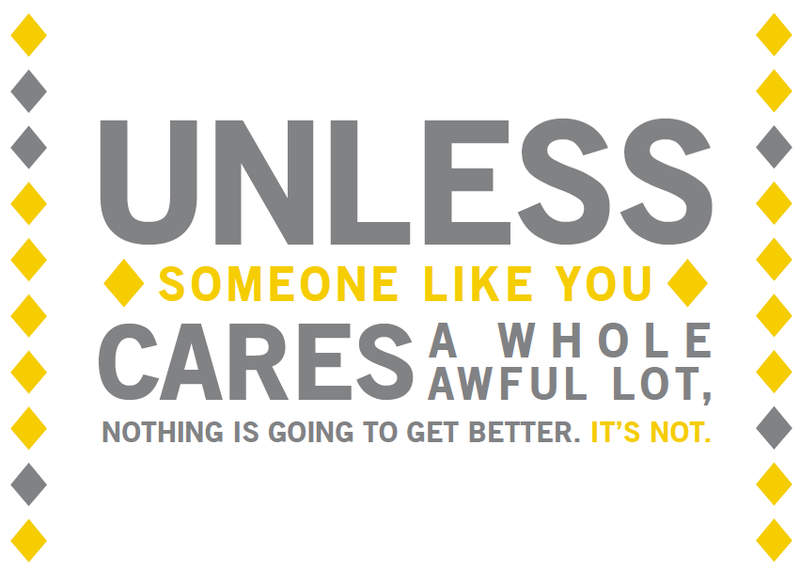 Because – unless someone like you cares a whole awful lot (about whatever it might be), nothing is going to get better. It’s not.